Are you sick of the fumes and noise (and environmental impact!) of gas powered tools? We hear you. Fortunately, there are a wide range of tools that are now being powered by more sustainable methods – including the ever popular pole saw. Read on to learn more about electric pole saws and what these awesome tools can do for you. What Makes a Great Electric Pole Saw? You want an electric pole saw that will be able to chomp through any limb, at any angle, no matter what kind of wood you are working with or how thick the limb is. Find yourself a saw that can do it all! Tree trimming is something many people automatically want to outsource to a hired service, and it can be intimidating to consider doing it on your own. You want to find a saw that anyone would feel comfortable using and will not overwhelm users with unnecessary complications. Electric pole saws have a lot of interlocking parts, and that can raise the probability of one part breaking down or wearing out over time. Getting a pole saw that can stand the test of time will save you hours and dollars that would have been spent otherwise fixing the saw. The Sun Joe SWJ800E Electric Pole Chain Saw is the premier electric pole saw for anyone interested in purchasing a pole saw with this kind of power mechanism. 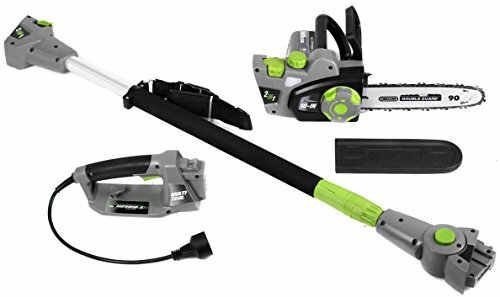 It accomplishes this distinction through its intentional design, which is specifically to be an extendable pole saw, not merely a chain saw attachment that you are able to then connect to an extending support pole. This intentional design results in a saw that is incredibly lightweight and can be easily maneuvered into angles that would be trickier for other saws to accomplish. 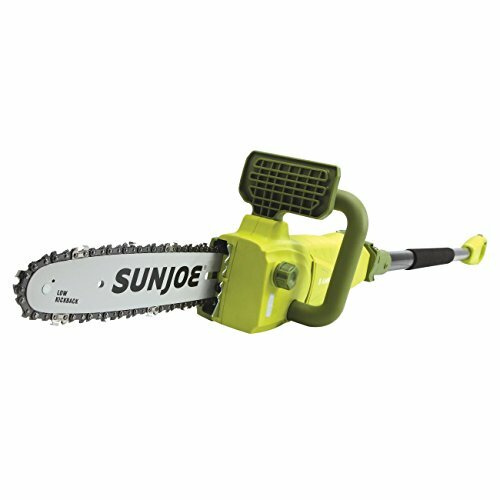 Because its specifically made to be extended, the extending parts have more rigidity than those of competitor saws, making the Sun Joe SWJ800E one of the safest models to use. Do not confuse its light weight with a light cutting ability though – this saw can hang up there with the best of them when it comes to chomping through wood! The Sun Joe SWJ800E Electric Pole Chain Saw is an ideal pick, with an intentional design that puts it head and shoulders above its competitor brand. You are definitely going to want a good supply of oil on hand when using one though. The Worx WG309 Electric Pole Saw is a little monster! There is nothing this electric pole saw can’t cut through – from evergreen, to pine, birch, oak, and maple, this model can chomp through a wide variety of different types of wood and plants, some with diameters of up to fifteen inches in thickness. It should be noted that this effectiveness is due in large part to the saw’s weight, which can be leveraged so that it pulls itself through the branches to make quick, efficient cuts. This is an example of a model that can also be easily used on the ground for clear cutting, as the saw component easily detaches and re-attaches to the pole component. This product is convenient to use, as it is quick and simple to assemble and even to clean, as it comes with an effective self oiling mechanism. There is not much to dislike about the Worx WG309! The Worx WG309 is a fantastic option that will be able to take care of anything and everything you could ever imagine needing to cut. This is due in part to its heavy duty construction, which does contribute to making this saw a good deal heavier than many of the other saws on this list. The Sun Joe SWJ807E Pole Chain Saw is an awesome model that is a great alternative to its cousin, the Sun Joe SWJ800E described above, if you are looking for a saw that has all the great qualities of the SWJ800E but can be easily detached from its pole component. 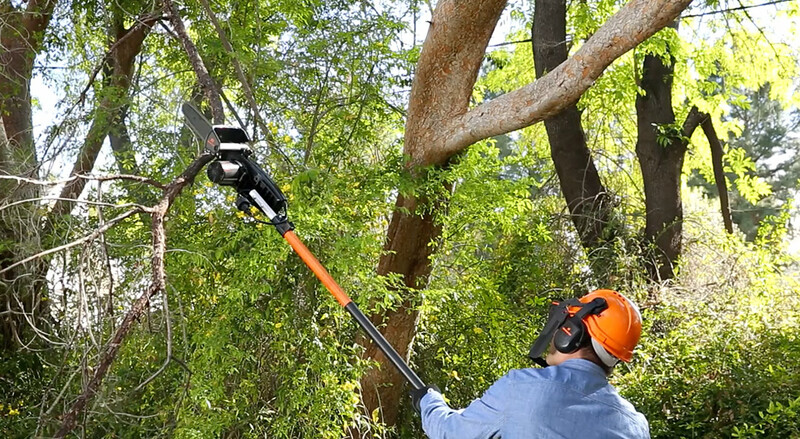 Users report this aspect of the SWJ807E is especially helpful when trimming trees, as it is a simple process to cut limbs so that they fall to the ground when the saw is attached to the pole, and then detach the saw and use it to further chew up the branches on the ground so they can be disposed of more easily. This saw is still noticeably lightweight and easy to handle, though do not think that is any sort of compromise on power – this saw can chew through tree branches up to twenty inches in diameter like they are absolutely nonexistent! The Sun Joe SWJ807E Pole Chain Saw is a great option with an element of versatility. It does have a smaller chain oil reservoir, but since this saw does not burn through oil very quickly, that is not much of an issue. The Remington RM1025SPS Ranger Electric Pole Saw is a great option that is hardy and heavy duty. Every component of this saw is made of high quality material, most noticeably the pole, which is made of a specifically designed balance of aluminum and fiberglass. This quality design contributes to the effectiveness of the saw itself – users report it can cut through limbs of up to eight inches in diameter, as well as a wide variety of wood, even more fibrous tree types such as fir, river birch, and crate myrtle. The well made pole extends to approximately fifteen feet in length, so there is not much you will not be able to reach when working with this bad boy. The pole and saw are both separate components and are both remarkably made on their own, but when used together, the result is incredible. Not to mention, it is an easy process to attach and detach the saw component from the pole component for a quick change when necessary. The Remington RM1025SPS Ranger Electric Pole Saw is a great pole saw that is well made of high quality material. Its only drawback is it does not come with an automatic oiling mechanism. 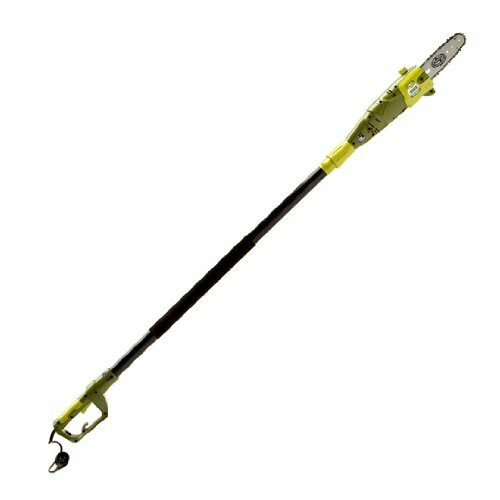 The Earthwise CVPS41008 Corded Electric Pole Saw is an incredibly accessible model that can be comfortably used by everyone, even those with little to no experience. It accomplishes this through an intentional design and a number of convenience features, such as its automatic oiling mechanism. Users report that this saw strikes the right balance between being long enough to make difficult cuts and also not being too long to the point where users feels they are losing control of the saw at its full extension. It is lightweight and easy to control, even when extended as much as is possible. It still produces just as much power as a full size chain saw despite its smaller size, so there is not much this saw will not be able to accomplish for you. If you want a lightweight, smaller option that anyone could use, you will not go wrong with the Earthwise CVPS41008. The Earthwise CVPS41008 Corded Electric Pole Saw is an excellent choice that is light enough and easy enough to control that anyone could feel confident when using it. Just know that the instruction manual is not nearly as well designed as the saw itself. It is true that electric pole saws tend to be less powerful than their gasoline powered counterparts. But for a well made option, this should not be a significant difference. Make sure you find yourself a saw that has enough power to get whatever job you might need done. By nature, the work you are doing with a pole saw will require you to be holding this saw upright and above your head for extended periods of time. It is not only inconvenient to have this kind of saw be on the heavier side – it can also end up being a safety issue. Assess your own capabilities (honestly) and find a saw that you will be able to effectively use without being concerned for your safety. Going along with weight, you definitely want an electric pole saw that can balance itself well even when it is fully extended. There will always be some top heaviness by nature with a pole saw, but a high quality pick will mitigate this situation better than a cheaper model. You probably noticed, in a lot of the saws we reviewed, that there were those with fused pole/saw systems, and those that were separate components, where the saw could be detached from the pole and used as a hand chain saw on the ground. There are pros and cons to both of these designs, with the combined typically being lighter and easy to manipulate, while the separate is usually more versatile. Length is an interesting consideration to make because of course everyone wants the longest saw possible so they can cut the most trees…but the longer the saw, the more difficult it is to control the saw’s cuts. Strike the right balance between effectiveness and safety features when considering a saw’s length. Automatic oiling mechanisms are great in that they save time and make saw use more accessible for those who may not be familiar with chain saw operation. However, an automatic oiling mechanism is one more component of a saw that could break or otherwise turn on you and require long and/or costly repairs. Electric pole saws are some of the most effective yard clearing tools you will be able to find on the market today. Make sure you find one that fits your specific needs, taking into account the factors we have analyzed above, and you will never regret your purchase.